Transcript écrit de tous les enseignements de Rinpoché à Savièse. 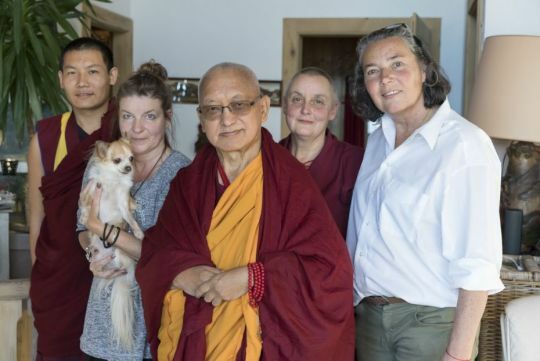 Lama Zopa Rinpoche with a student at the Baladin Theater, Savièse, Switzerland, November 2018. Photo by Olivier Adam. 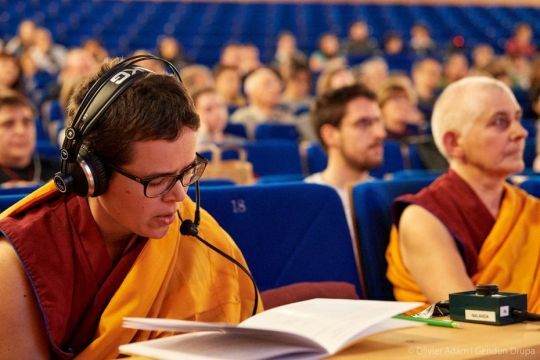 Gendun Drupa Centre, an FPMT center in Martigny, Switzerland, hosted Lama Zopa Rinpoche from November 14 until December 4, 2018. The center’s spiritual program coordinator, Séverine Gondouin shares the story with help from Caro Solloso and Sophie Lacroix. “Rinpoche loves animals a lot. Although he is vegan, he asked for cheese to share with my dog Shiva during the meals. He changed the names of the animals who were with us at the chalet, saying that it was better for them to have Dharma names. Sophie’s cat’s name was changed from Shatwa to Mahamudra. My dog Shiva became Bodhichitta,” Caro said. Ven. Lhundup Topgye, Caro Solloso with her dog Shiva renamed Bodhichitta by Rinpoche, Lama Zopa Rinpoche, Ven. Anet Engel, and Sophie Lacroix, Switzerland, November 2018. Photo by Ven. Lobsang Sherab. “Rinpoche arrived in the land of cows, mountains, and chocolate. We were there—a few students—in the night, waiting for this incredible being that Switzerland had been waiting to come for so long. We didn’t know if his visit was a dream or reality,” Sophie said. 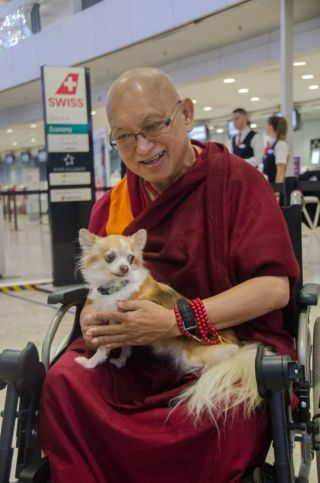 Lama Zopa Rinpoche with Shiva who he renamed Bodhichitta at the airport, Switzerland, December 2018. Photo by Séverine Gondouin. “When the meal ended everyone there had things to do, but Rinpoche stayed there to teach us again and again. Ven. Anet cooked for us, and each meal was a masterpiece. Patience was required because the schedule was unknown. Each meal was a tsog prepared with care and attention. These were beautiful teachings of how to live our everyday life—every moment for others,” Sophie concluded. On Friday evening, November 16, everyone was ready to listen to Rinpoche’s teachings. Rinpoche generously taught that whole weekend at the Baladin Center in Savièse, Switzerland, demonstrating great compassion for us all. He emphasized the importance of developing a good heart, cherishing others—the source of all happiness—and to change the purpose of our lives from self-cherishing to serving others. 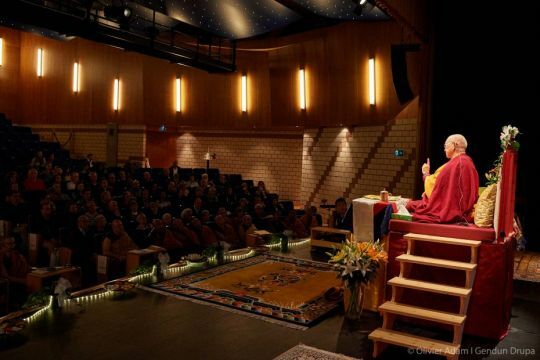 Lama Zopa Rinpoche at the Baladin Theater, Savièse, Switzerland, November 2018. Photo by Olivier Adam. Rinpoche also deeply taught on the nature of the mind, clearly perceiving objects, and how the “I” is merely labeled—a mere name—not existing from its own side. He taught that there is no real mind at all, that it never exists the way it appears to us, but is an extremely subtle phenomenon. He instructed that we should clean the dust—the defilements—on the surface of the mirror so that the mirror can give a reflection. Rinpoche taught we should see the “I” on the “I” so that there isn’t anything to hold onto any longer. Look at the dream as a dream. Unify emptiness and existing without contradiction. 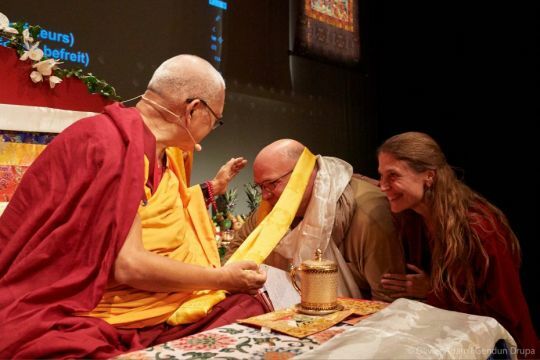 Lama Zopa Rinpoche with Gendun Drupa Center director Jean-Paul Gloor and spiritual program coordinator Séverine Gondouin at the Baladin Theater, Savièse, Switzerland, November 2018. Photo by Olivier Adam. Rinpoche encouraged us to bring all sentient beings to enlightenment and to keep the mind in the right view, free from hallucination. He also talked about the importance of developing a good education in schools. Rinpoche said that we should focus our awareness on ending the harm we cause to ourselves and others. We usually take care of the body but not the mind. Rinpoche suggested that we help children keep their minds healthy, positive, and virtuous to benefit themselves and the world. He also insisted on practicing satisfaction. Rinpoche emphasized that we should not keep what we learn on an intellectual level, but that we should actualize the teachings and experience them in our hearts. This way our practice becomes holy Dharma, not with a motivation attached to this life—to the eight worldly dharmas—but that we renounce. That will bring incredible peace and happiness, and also all that we do will become Dharma. 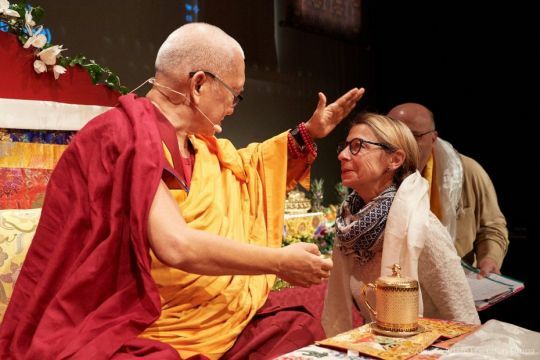 A student receiving a blessing at the Baladin Theater, Savièse, Switzerland, November 2018. Photo by Olivier Adam. Last but not least, Rinpoche talked about devotion to the guru. To take care of our mind—this is the way to follow one’s guru’s advice and fulfill the guru’s wishes. This is the way to receive blessings. Rinpoche spoke about his own teachers who inspire him so much, including His Holiness the Dalai Lama, Panchen Rinpoche, and Khadro-la (Rangjung Neljorma Khadro Namsel Drönme). We also did a Lama Chöpa tsog together on Saturday. The following day Rinpoche offered the Chenrezig Ngensong Kundrol initiation. Ven. Losang leading a review class at the Baladin Theater, Savièse, Switzerland, November 2018. Photo by Olivier Adam. The Swiss nun Ven. Losang (Rita Riniker) offered a review class on Saturday and Sunday morning. 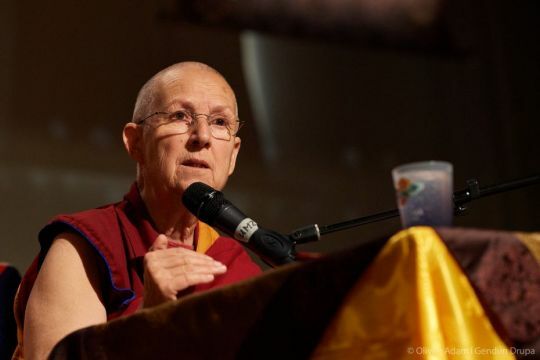 People were delighted by her teachings, presence, and inspiration. We thank her a lot as she did that job with all her heart. This really touched people, opened their hearts, and awakened their wisdom as well. 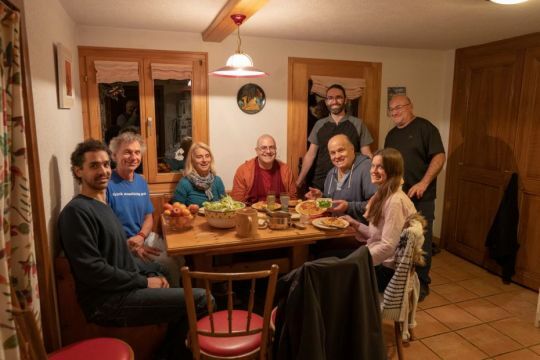 Some of the event volunteers with dinner cooked by Michel Fröhlich and Jean-Paul Gloor, Switzerland, November 2018. Photo by Harald Weichhart. About two hundred people attended Rinpoche’s teachings hosted by our center. This was made possible thanks to the generosity of many people including the Gendun Drupa Center committee, who began to prepare this event months in advance, and thirty-six volunteers, who helped with food; arranged Sangha accommodation; made carpooling arrangements; organized the altar, shop, and welcome desk; and helped with the technology. French language translator Ven. 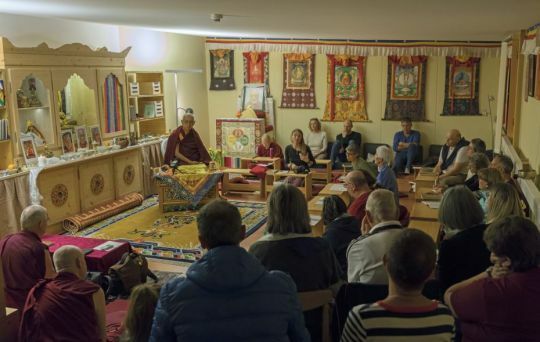 Lobsang Detchen at the Baladin, Savièse, Switzerland, November 2018. Photo by Olivier Adam. We are also thankful to French language translator Ven. Lobsang Detchen, Italian language translator Ven. Siliana Bosa, German language translator Ven. Birgit Schweiberer, and Ven. Joan Nicell, who was transcribing from Nepal. We appreciate the audio team—Alexis Benelhadj, Harald Weichhart, and Antoine Janssen— as well as the donors, who helped us cover the event’s costs. We thank them all deeply from our hearts. 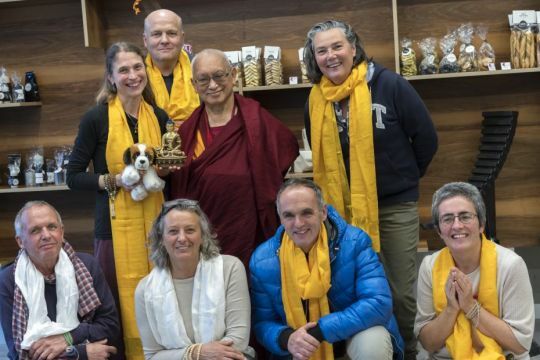 Lama Zopa Rinpoche with Gendun Drupa committee members following lunch in Martigny, Switzerland, November 2018. Photo by Ven. Lobsang Sherab. On Monday, November 19, Rinpoche met with the Gendun Drupa Center committee for a lunch in Martigny. It was an opportunity to thank everyone for their work. The atmosphere was cheerful, filled with gratitude and love. Rinpoche then taught two evenings at Gendun Drupa Centre in Martigny. We met that second evening because it was Sophie’s birthday, and Rinpoche wanted to offer a Lama Tsongkhapa Guru Yoga and tsog. Rinpoche also took the opportunity to bless our center and consecrate it. Students welcoming Lama Zopa Rinpoche and Ven. Roger Kunsang to Gendun Drupa Center, Martigny, Switzerland, November 2018. Photo by Séverine Gondouin. Both evenings were so precious—having Rinpoche in our small center, with so many people who were meeting him for the first time. It was a great gift for all students. Everyone was so happy. We finished really late that Tuesday night, but it was not a problem. We carried the energy from the evening with us when we went to work the next day. 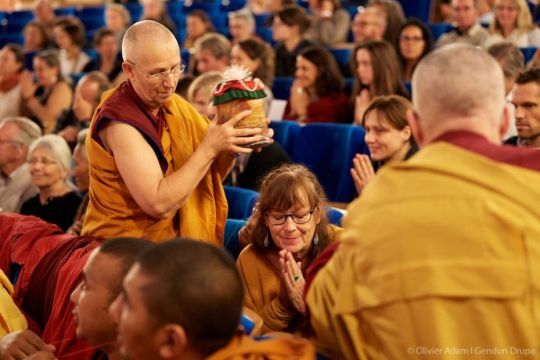 Lama Zopa Rinpoche teaching at Gendun Drupa Center, Martigny, Switzerland, November 2018. Photo by Ven. Lobsang Sherab. We also had a surprise to announce that night: Rinpoche, who planned to leave on Wednesday, decided to stay on at Sophie’s house and do a personal retreat of almost two weeks. We organized things very quickly, including visas and food. It was a great joy to be able to continue closely working for Rinpoche. As he was still in Switzerland on his birthday, he was offered a delicious sugar and gluten-free cake baked by one of our students. 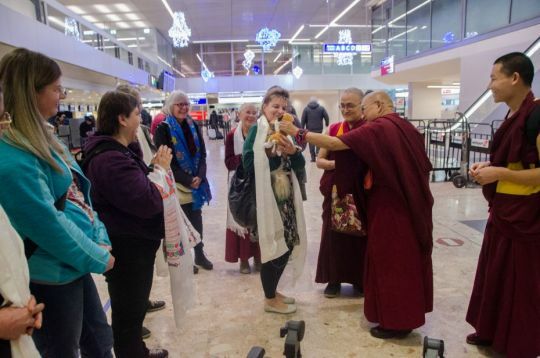 Lama Zopa Rinpoche offering toys to students at the airport, Switzerland, December 2018. Photo by Séverine Gondouin. Rinpoche departed Switzerland for Nepal the following day, December 4, to teach the 51st month-long Kopan lamrim meditation course students. Many students came to the airport in Switzerland to say goodbye. 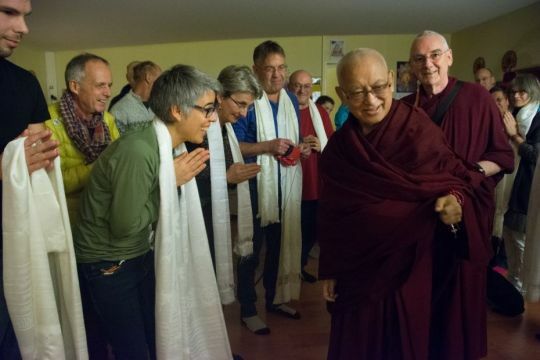 Everyone was so enthusiastic, so grateful, and so inspired by Rinpoche’s visit to Switzerland. It will surely give a new wave of energy to our center and a greater understanding of the meaning of guru devotion.